I grew up going to Chevys Fresh Mex restaurant pretty often since it was just around the corner from my parents’ toy store, Tex’s Toys. Chevys food was pretty good on the whole, but the main attractions for me were a.) watching the mesmerizing tortilla making machine in action and b.) 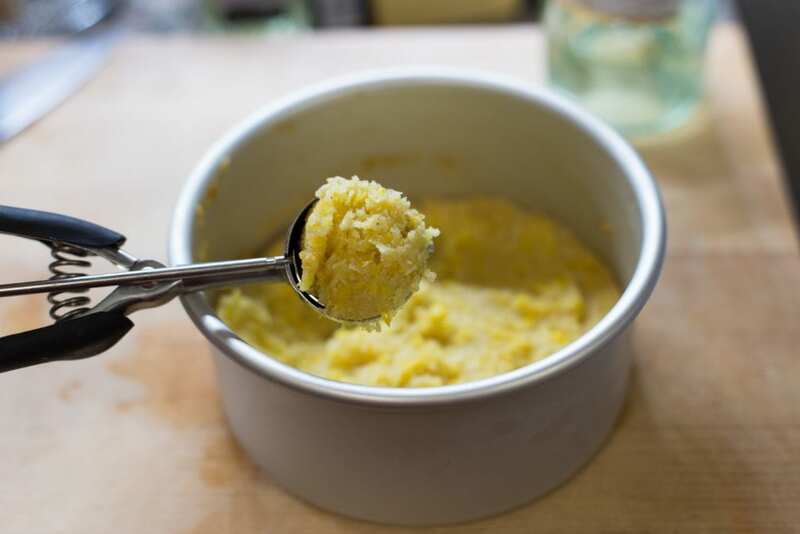 savoring the little scoop of sweet corn pudding, a.k.a. tomalito, that came with most dishes on the menu. 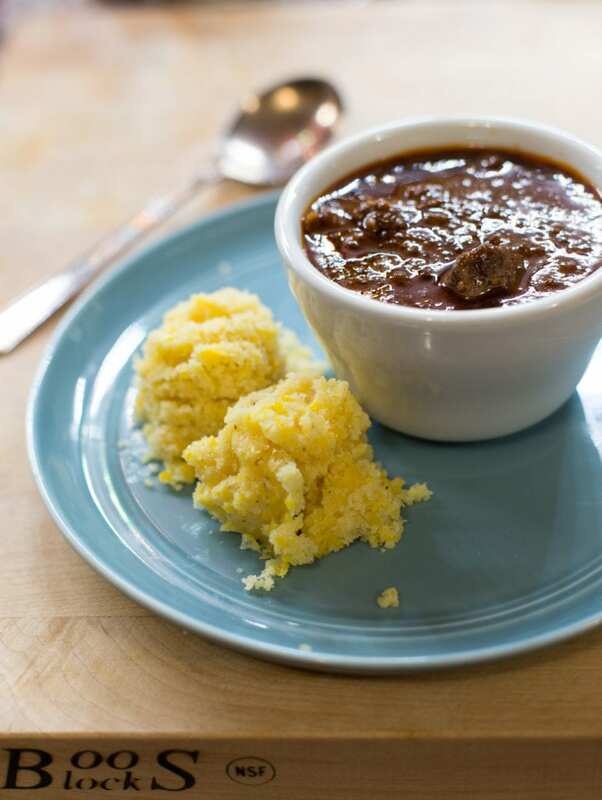 Tomalito is traditionally steamed or baked over water, so it lends itself perfectly to being prepared in a 6-quart Instant Pot using the pot-in-pot method. 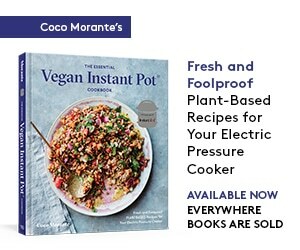 You just set down the wire metal trivet inside the Instant Pot, pour in a cup or two of water, then set a pot or pan on top of the trivet. 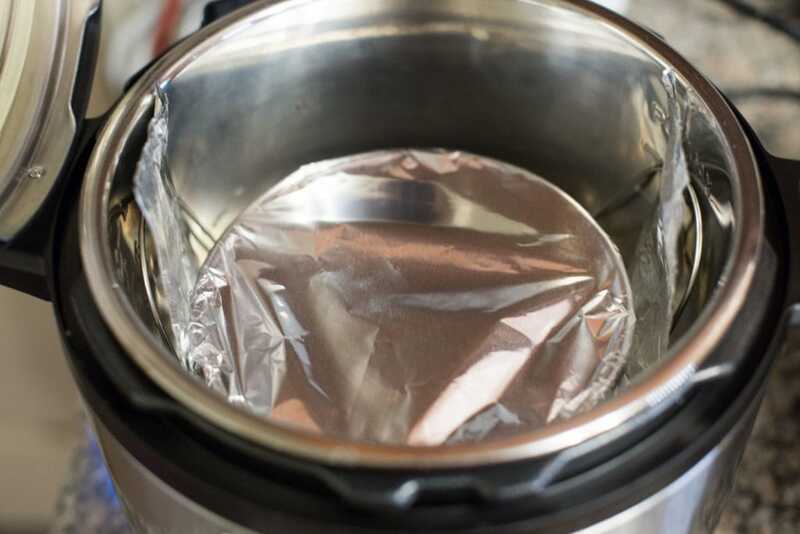 This is the method people use for making Instant Pot cheesecakes (and the reason that 6 and 7-inch springform pans are always in high demand on Amazon!). One tricky thing about pot-in-pot cooking can be removing the smaller pot from the larger one. 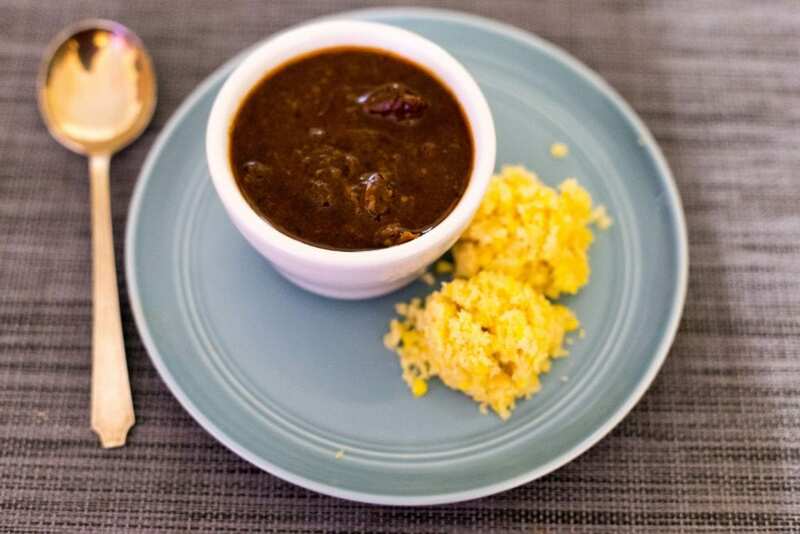 It’s pretty tricky to grab the little arms of the metal trivet to lift a dish or pot out of the Instant Pot, especially when everything is very hot after cooking. 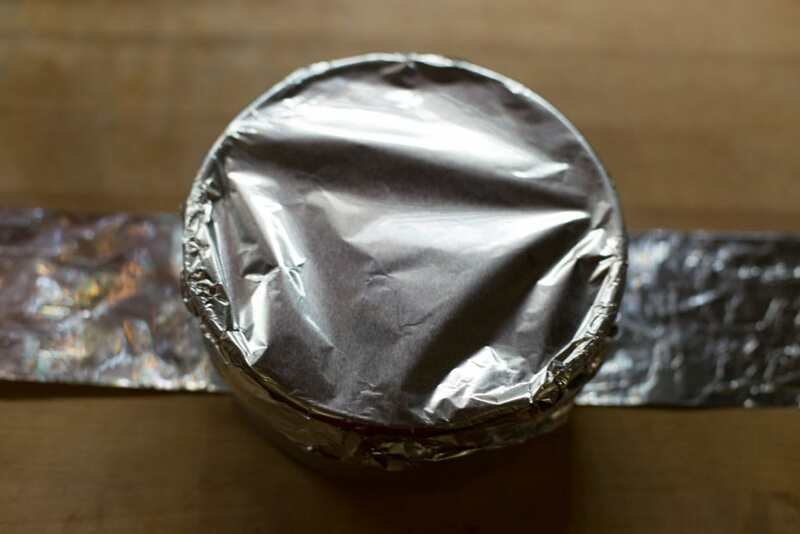 To make this part easier, I fold a piece of aluminum foil into a long strip, place it under the cake pan, then use it as a sling to lower the cake pan into the pot and lift it out again. For the tomalito, you can use any 6-inch round cake pan. A springform, removable bottom, or simple 1-piece pan will all work well. The batter is extremely thick, so it’ll stay put in whatever vessel you use. I also use a food processor to make quick work of the batter, so this recipe comes together really quickly! 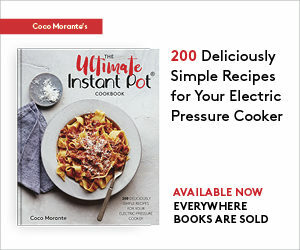 Once you start the Instant Pot cooking program, it’s totally hands off (and it’ll stay warm in the pot for up to 10 hours if you want to make it ahead of time, too). To serve the tomalito, you can use an ice cream scoop to dole out portions a la Chevy’s, or just cut it into wedges. We had ours alongside bowls of chili last night, and it brought me right back to my childhood Tex-Mex memories in the best way. I hope you enjoy it too! Serve a scoop of this sweet, dense corn pudding with any Tex-Mex meal. Grease a 6-inch cake pan with butter. In a food processor, combine the masa, sugar, salt, and baking powder. Start it on a low speed (I use the "Dough" setting on mine). Through the feed tube, pour in the melted butter and half and half. Process just until a stiff dough forms, then turn off the food processor and scrape down the sides of the bowl. 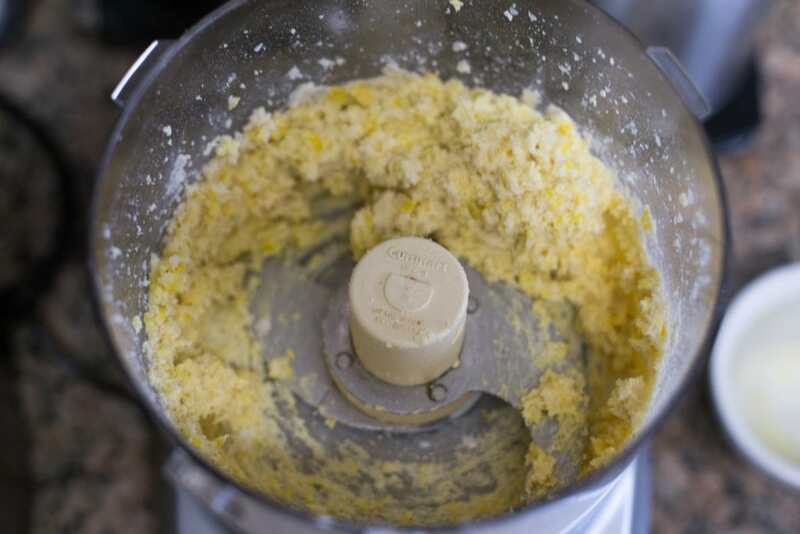 Add the corn kernels and process in about five 1-second pulses, until the corn is incorporated into the dough but some larger pieces still remain. Spread the batter into the greased cake pan. Cover the pan tightly with aluminum foil. Make an aluminum foil sling (about 3 inches wide by 18 inches long) and place it under the pan. Put the wire metal trivet and 1 ½ cups water in the Instant Pot. Use your aluminum foil sling to lower the pan of tomalito into the pot, and fold down the strips so they are not sticking up over the sides of the pot. Make sure the strips of the sling are not directly under the float valve -- there should be a clear path for steam to allow the pot to seal. Open the pot. Wearing heat proof mitts, use the foil sling to lift the cake pan out of the pot. Carefully uncover the pan, then use a cookie scoop to serve the tomalito or cut it into wedges. Serve the tomalito while it is warm -- it will set up and become more crumbly as it cools. 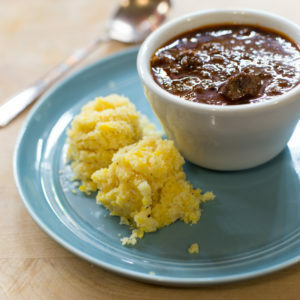 You can double this recipe if you like. Use a 7-inch cake pan and keep the amount of water in the pot and the cooking time the same. Thank you for supporting Lefty Spoon! Is it ok to use Instant Masa Harina for this? I’ve never used it before so I don’t know anything about it. Yes, the instant kind will work well!